Elvis Enthusiasts Unite: Review: The National @ Lollapalooza on 8/8/10. 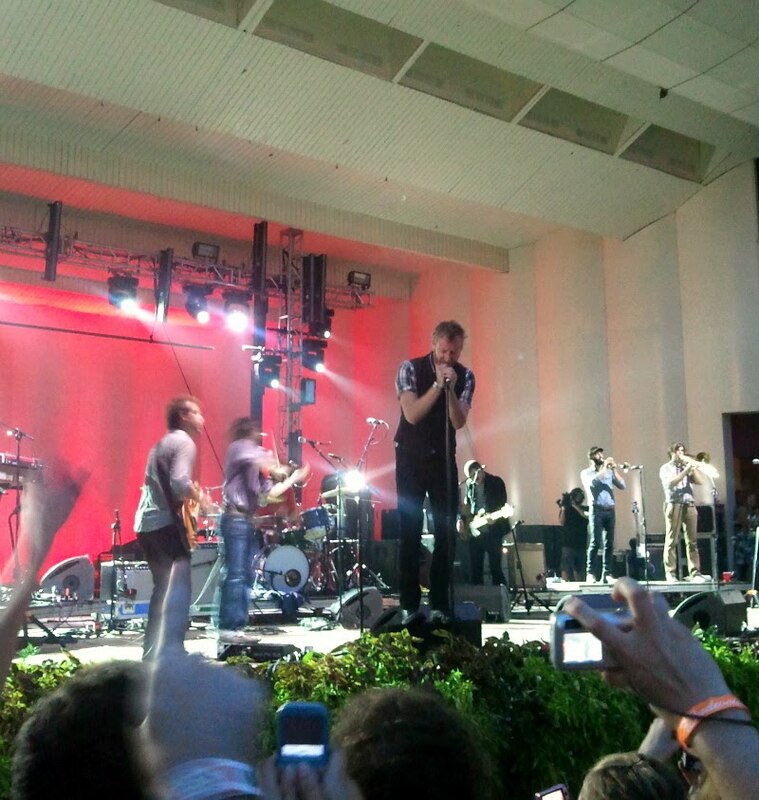 Review: The National @ Lollapalooza on 8/8/10. Every so often, I’ll go ahead and consider myself a music journalist. I feel that I have gone through the battles so many in that number still wage on a daily, weekly or concertly basis, that I ought to get away with it, too. For a number of years, I was paid and not paid as one who regurgitated band’s press releases into newspaper article form, interviewed musicians both well-known and not overly so, got to say phrases like “I’m on the list” to the thuggish sorts guarding the doors a lot, posed in photos with bands, hung out in smelly tour busses, let the wandering minstrel sorts sleep at my place and eat my Grape-Nuts, reviewed concerts and digested CDs into appropriate-sounding “sound” bites. I did it in a time few around me were doing so. And, all in all, it was a terribly fun, if occasionally stressful, existence. Sometimes I did it simply to get a free pass into a show. For many years, it was the only way I could actually see any concerts, as I could barely afford to feed myself. But, in the end, I just did it for the love of writing … as in there were no rules for me to adhere to. No one person could tell me how to feel about a piece of music, or how it had to sound, if I was supposed to love it or not and how long or short it had to be. Nobody harped on me for not using that inverted pyramid style, either. It kept me in practice. I did it for as long as I needed to. I did it until I could afford to start seeing concerts again, without begging for an “in” to a press person who lorded over the touchy situation. And, the less I reviewed concerts, the more my well-honed powers of observation would begin to wane a touch. I would see and smell and think less than I had before, now that it was less a way of life and more a moderately selfish hobby. Then again, sometimes that music critic hat falls back on my head and I’m able to coast along on that bike seat without so much as touching the handlebars. Okay, so maybe that’s overdoing it. But, last weekend, a way into Chicago’s Lollapalooza festival fell into my lap. My friend Heather over at Fuel/Friends wasn’t able to make it and I, in turn, was empowered to be her set of music-seeing eyes for the duration of the festival. The opportunity was dangled in front of me and I so snatched at it. Out of all the bands I would see while there—and so very many for the first time—there was only one that I realized I had invested more time and money and out-and-out devotion to than the rest. That band was (and is) The National. So many solid albums into their career, a lot of my radio-listening friends still don’t know the band all that well and that’s okay by me. Those who do know them are inclined to become devotees as well. I support that brand of adoration, as I count myself among those who sing along to songs and point out favorite turns of phrase and verses. It is what it is. You like what you like. And, you know, it’s a special challenge in and of itself to try and put into words some of the reasons you like a band when you really, really like them. In fact, the word “like” may not even be strong enough. Comparing The National to other bands I like is, well, it’s akin to remembering a pretty enough girl from high school versus the one you’d trip over yourself for, clamming up when she was near and feeling just this side of physically ill. One is decidedly more than the other. That said, here goes a little bit of nothing and a lot of everything. I hope I still have it inside me to reflect into that long moment, the one that lasted an almost perfect 90 minutes. When I arrived dutifully early to see The National, more than an hour before they would take the very large stage in front of us, at least 20-30 likeminded kids had done the same already. They got to flank the stage. I didn’t. Now, this was two and ¾ days (out of three!) into the festival and I was both feeling and looking like I’d nearly lost the war. My feet were taped up with Band-aids and white medical tape to combat the flip flop blisters, my legs were considerably muddied from that morning’s rainstorm, my face, neck and arms were a lovely shade of baby tomato red and I was fighting against the fiercely humid conditions with as much sweat as I could muster up. And, to make matters worse, my back hurt. Bad. Nevertheless, I waited it out. I stretched and squatted and tried to take my mind off of the sad fact my real estate was getting progressively smaller the longer I stood in place. The good thing was, I stopped thinking about all of these pitfalls once Matt Berninger and his troupe of misfits casually took their spots. Matt was more slight than I thought he’d look and really pretty unassuming for a bearded guy in a smart-looking three-piece suit. That’s before he started to sink into the songs he’d penned, though, placing both hands on his microphone like it was holding him up, closing his eyes and moving straight into that impossibly deep, clear resonating voice of his. He didn’t seem to always enjoy what it was he was doing, as he’d spend the portions of his songs when he didn’t have to sing pacing around the stage, yelling who-knows-what* to riotous applause and taking long pulls from his iced cup of white wine (it from a bottle he’d empty before the set was through). *Consider the last minute or so of “Murder Me, Rachael,” which has its singer moving from his low, smooth tone to out-and-out blistering screams and you get a glimpse into what he did last Sunday night, over and over. Additionally, hearing him scream “I’m evil!” on “Conversation 16” was also one of those happy, if frightfully alarming, surprises. The band’s songs get described as largely morose (or, by Berninger’s own admission that night, “dark and mean”), but it’s hard for me to buy into that description. They are dark on their surface, certainly, in the same way Stephin Merritt’s are (he of the Magnetic Fields), but, to me, they’re testament to a guy who wants to figure things out, so he questions and supposes and makes assumptions all his days. Are some lyrics more pessimistic than others? Maybe. Do some like to represent the bad days instead of the good ones? Sometimes. Is he, well, a little on the twisted side of things? I don’t think so. It could just be a bit of a persona he’s gone and created for himself. Either way, I can get behind this guy. I can side with him without so much as trying to. You read a good poem or hear a particularly affecting song, you end up discovering how it applies to you. 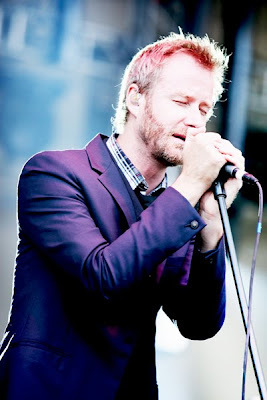 This is how I listen to The National’s music sometimes. I often feel like I’m looking out his eyes and feeling the thoughts he's addressing. The National, with all its layers, certainly knows how to put on a show. For as slow as I felt it had the potential to really be, my hat is off to Matt for taking things places his other band members either couldn’t or didn’t want to. While they more or less stayed that melodic course, he climbed a fence, left the very high stage regularly to walk amongst those who’d amassed to see, hear and sing along with him and, at one point, poked his head right in my direction (during "Abel"). Several of us rushed forward, some trying to take photos, others just trying to get nearer than they were. Me, I reached out and touched his hand and microphone, then got an unexpectedly up close and personal view of the man I’d never even seen in the flesh until that night. And those dark eyes of his? Impossibly sad and faraway. That glimpse leads me to suppose he really is singing about his broken heart a lot of the time. These are his naked truths set to music. My back screamed out for mercy and my feet felt too heavy and swelled to stand in my flip flops for as long as I did, but I kept placing all of that in the back of my mind. The longer it went on, the more I didn’t want an end to come. That’s how it always is, isn’t it? It did end, mind you, much to my chagrin, me dizzy with pain and what I imagined was a touch of heat stroke. As I fell to a close spot of asphalt once the crowd faded and a welcome breeze returned, Arcade Fire was not far away from my spot, singing “No Cars Go.” I tried to pay attention, I did, but The National had taken it out of me. In one of those good ways. Seeing a concert that ends up in the “beyond compare” pile of memories allows you to talk about it a long time and share it with others and say things like, oh, it melted your face off and stuff of that ilk. When you’re already a bit of a raving fan of said band, however, I think it serves to cement your love of them, maybe even forever. It solidifies that give-and-take relationship, in a sense. You trusted them to take you to a place, they ended up doing so and then went a few steps higher than you’d ever planned on. They exceeded your already high expectations. If only all bands understood that’s what they should do, and do always, allowing for a healthy dose of consistency … you know? If only. It’s got to be hard to put on a show like they did in Chicago every single night they’re in a new city, though. It just has to be. I must say, one reason I really like The National is for the originality they have stumbled into. If you write about music for years on end, you usually find yourself comparing one band to another or discovering that they wear their influences on their sleeve. The National, on the other hand, don’t really sound much like anybody. And yet, there’s a familiarity that rings through their albums all the same. The cookie cutter gets stomped on. That’s a serious accomplishment right there, whether they attempted it or not. I'd guess that's what most bands want. Sweet, blessed originality. Bravo, guys. Eh, maybe I ought to go back to my music writing days. I can certainly blather on and on about it. It’s these passions, you see? They lead me in this direction, whether I like it or not. That’s quite enough. And, thank you, Matt and the rest. See you again in October. Song I wish they had sung: “Wasp Nest.” No reason, I suppose, other than it’s very, very romantic and beautiful. that gave me chills. thank you. Remember like five years ago when I bought "Sad Songs for Dirty Lovers" on a lark at Graywhale in Draper during a lunch adventure (hopefully not the one involving Pastrami Steam) with Creent? Ah. Like it were yesterday. Lucky You. Tell your Mom thank you. She apparently taught you "sharing" very well. :) You are one who doesn't hold back the good... welcoming others to enjoy the important things alongside with you.